– Those that explore the strangeness of the new world. – Those that explore the loss of the old world. – Or, my favorite, those that explore the spaces in between both. Between then and now. Between catastrophe and cleansing. Between the barely civilized past and the uncertain, feral future. 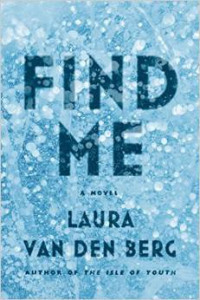 Laura van den Berg’s debut novel, Find Me, takes that richly rewarding third path and finds a wealth of materials in the cracks that form in a world overrun by a terrible disease. In this unsettling world, humans lose memories before they lose their lives. The spaces between memory, myth, and mystery serve as springboards for the journey of our narrator, Joy Jones, an orphan who has always lingered on the troubled fringes. An outsider to begin with–as a baby she was left outside a Boston hospital by her birth mother–she sees things others don’t and possesses a sharp, clarifying sense of story. Joy is a woman with no past, or no past she cares to claim. Her theory of surviving the sickness? For the immune the flaws in our memory protected us. Take me. Already my mind had washed away what it could not stand to remember. A flyer for a missing girl, taped to a concrete post, stopped me. From the date of birth, I knew I was around the same age. The girl even looked a little like me. She had been missing for six years, a span of time that made the flyer seem more like a memorial than a way to search. I stared at the number and imagine what it would be like to look at a flyer and recognize your own face, to realize you had once been someone else, that people were out there looking for you. Van den Berg sets up this unsteady search by gracefully, delicately creating a world so close to our own that it’s almost rather a parallel universe than a fiction–a place where that one wrong turn, that one key decision or difference has rippled out and changed everything. Everything, of course, but the people, who are still recognizably, poignantly human. To her credit, van den Berg is more interested in the survivors than the landscape. She’s more interested in what the static of loss and waiting drives them to. In the hospital, I have seen women with bangs that hang like curtains over their eyes and ends so split it looks like they’ve been electrocuted. I have seen a pixie cut that never seems to grow. In the hospital, I have seen men with sideburns, men who only have swirls of hair at their temples, men with small bald spots on top of their heads, round and shiny as coins. There are all kinds of people in here. I always find it impressive when a writer is sure-footed and self-aware enough to know the exact vehicle to best showcase their talents. Housed without spectacle or vanity, van den Berg’s strengths as a writer are all on display here. The way she builds a world from memories and fragments, where dark humor is a momentary relief from all the surrounding decay, where lonely women try to find some semblance of peace in a difficult place and the unquiet of the mind–the book is solid as a rock at its foundations and dazzling in its revelations due to just these singular literary gifts.